Mounted full view storm door is all aluminum with white durable finish. 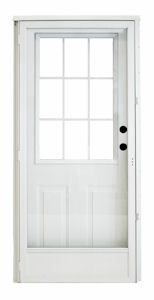 All of our storm doors feature safety glass panels. Full view storm door invites the sun and light into your home and brightens any room, while helping keep the heat/cool air inside your home. Storm door hardware is available in both white or black finish. See our door hardware section to order.